Bellagio is a classic, elegant and sophisticated dark brown. It is a true deep, solid yet multi-dimensional rich, glossy Natural Dark Brown Hair Colour and our third darkest colour option. 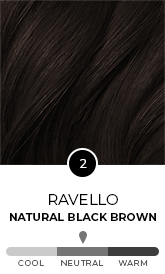 If you are after a deep, dark brunette colour which is also easy to live with and maintain, then Bellagio could be the colour for you. Bellagio is a true neutral colour and suits many different complexions and colour undertones.